A fantastic book that is perhaps the best exposé ever written on the world’s largest and most popular religion (approximately 2.5 billion adherents) from an ‘insider’ who participated in Christianity for many years. You can search far and wide and you will not find a better book on what Christianity is, why it is a successful failure, and why it’s being a successful failure should be of urgent interest to you and those you care about. In Christianity: A Successful Failure, author Tim Spiess holistically yet simply, using non-complex language, puts forth the best worldview possible for humanity. He starts with common existential issues that we all face and provides insightful and satisfying answers to life’s most important questions. Spiess avoids petty doctrinal discussions and uses many creative and insightful analogies and metaphors to reveal why Christianity is a successful failure. Reason, logic, and observation are used well to demonstrate that many of the foundational beliefs and practices of Christianity, not only have nothing to do with the real, historical Jesus of Nazareth but actually nullify and cancel out his most important teachings. 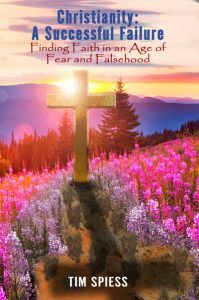 This book rises above religious concepts and movements like the Reformation and seeks to bring a paradigm change in people’s view of God and this life we are given. In the last section entitled, “The Solution”, what we all desperately need to solve conflict, loneliness, and emptiness in our lives is revealed. This book will change your life IF you are truly open minded! After being raised by a physician and his wife in the U.S.A in New York and marrying into a wealthier millionaire family; after earning a Bachelor of Science degree in essentially Environmental Science at the University of Vermont, as well as a Master’s of Business degree from Pace University; and after having successful career jobs at private companies like IBM, Ryder Transportation Services and McKesson; something happened to Mr. Spiess that radically changed his life…something that totally changed his perspective and the ‘trajectory’ of his life. Mr. Spiess is a unique person in that in the U.S.A, he has experienced persecution for his faith. He has had beloved children wrongly taken away from him and ordered by the government not to communicate with those children; has been wrongly fired from jobs; has had rocks thrown at him; has been slandered; has been asked by religious leaders not to come back to their churches; all for doing his best to speak what he believes is true. He has not experienced persecution due to saying obnoxious or rude or crude things or aggressively pushing ‘his faith’, but rather for just proclaiming truths about what people should value in life. Mr. Spiess has walked away from ‘careers’; has sold houses due to faith and lived with his family in an RV. People who don’t understand Mr. Spiess would say he has given up much or he has thrown away or wasted much. Mr. Spiess would say he has gained much. This author has somehow escaped most of the boxes that people live in and view life through, has risen above those perception constraints, and has produced a truly unique and insightful work that has the potential to bring desperately needed positive change to many, many people.